Summary: Every generation on the island of Fennbirn, a set of triplets is born: three queens, all equal heirs to the crown and each possessor of a coveted magic. Mirabella is a fierce elemental, able to spark hungry flames or vicious storms at the snap of her fingers. Katharine is a poisoner, one who can ingest the deadliest poisons without so much as a stomachache. Arsinoe, a naturalist, is said to have the ability to bloom the reddest rose and control the fiercest of lions. 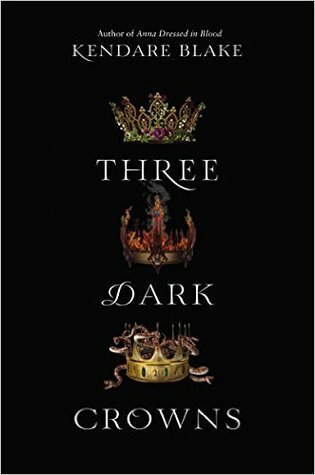 Review: Three Dark Crowns is a mirror into the lives of three future queens fated to kill each other for the crown. The triplet sisters belong to three groups, each with their own powers, motivations, and schemes to maneuver their queen to a bloody victory. But of course, nothing goes according to plan. The world of Three Dark Crowns and the inner lives of sisters Mirabella, Katharine, and Arsinoe are rich and complex. Of course, as a result, there’s a bit of a learning curve in the first few chapters. It takes a little time to figure out what’s happening, who’s who, and everything else, but once you do, it’s easy to sink into the fascinating and, at times, heartbreaking twists and turns of the story. Three Dark Crowns is told from the perspective of the three sisters, and it’s incredibly well done. In contrast, I was a bit thrown by a side character’s motivations and actions (Joseph, what?!). Similarly, the romance at times veers toward the classic YA insta-love. But, considering the pace and epic fantasy style of the book, it almost felt fitting. I pretty much read this through in one go — and usually, I steer clear of dark fantasy, but after the first few chapters, I was ready for the long, 400-paged haul. I’m definitely grabbing the sequel when it comes out!